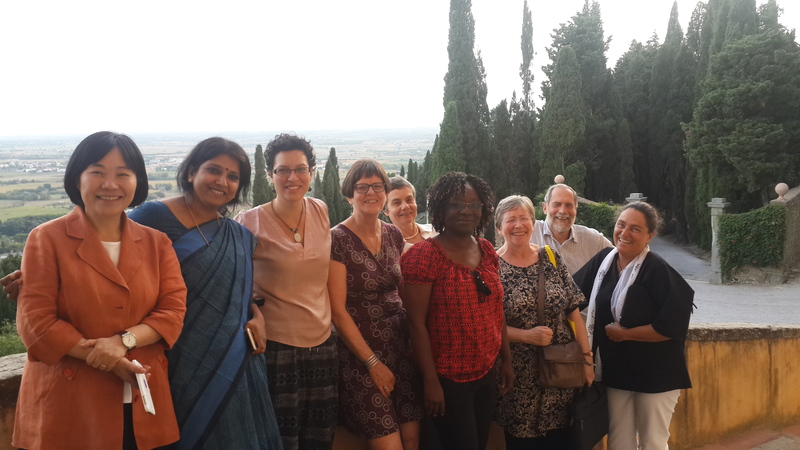 The first meeting of the IMU Committee for Women in Mathematics took place in Cortona, Italy, Sept 4-5 2015, immediately following the 17th General Meeting of EWM in the same place. Members presented reports of activities for women in mathematics from various parts of the world. In the last two years, women mathematicians have come together to launch meetings and networks in many countries. Helping to establish and support such networks at the continental or subcontinental level, especially in Asia, Latin America and Africa, is the CWM’s most important goal from now until ICM Rio 2018 and its budget will be used mainly for this purpose. CWM will shortly be launching a call for proposals for actions to support this aim. It also plans to organize a pre-ICM 2018 event called (WM)² : World Meeting for Women in Mathematics. A detailed report of the meeting can be found here. CWM’s first meeting. Left to Right: Sunsook Noh, Neela Nataraj (for Sujatha Ramdorai), Carolina Araujo, Magnhild Lien (for Kristin Lauter), Caroline Series, Marie Françoise Ouedraogo, Marie-Françoise Roy, Bill Barton, Betül Tanbay. Photo by Alicia Dickenstein, the IMU EC observer present at the meeting (substituting for John Toland). This entry was posted in active on September 10, 2015 by series. The Association for Women in Mathematics (AWM) has been awarded an ADVANCE grant of $750,000 from the National Science Foundation to support the project Career Advancement for Women Through Research-Focused Networks. The project is funded for five years and will focus on establishing research networks for women. The Research Collaboration Networks for Women will be modelled on the successful WIN Network, (Women In Numbers) in number theory, which ran several collaboration conferences at Banff International Research Station (BIRS). Networks WiSh, WhAM!, WhAM!2, WINE, WIT, WIG, WINART, Women in Math Biology, and Algebraic Combinatorixx have already been launched. More information about the Career Advancement for Women Through Research-Focused Networks project will be made available on the AWM website.